There are cases when SQL Server doesn’t normally realize it can rely on index order, but you can make the platform realize it with some extra manipulation and creativity. This article is the first in a two-part series in which I describe such tasks and solutions. This month I’ll talk about avoiding a sort with the Merge Join (Concatenation) operator. Next month I’ll describe avoiding a sort when needing the data in descending order. One of the advantages of B-tree-based indexes is that they organize the data ordered by some index key. SQL Server can then rely on index order to present or process data ordered (for operations such as ORDER BY, GROUP BY and JOIN), without the penalty of an actual sort operation. Pulling the data preordered from an index has linear scaling since the cost of an ordered scan is simply proportional to the number of rows involved. Puling the data unordered and then applying an actual sort operation scales in an extra-linear fashion--more specifically, in an n log n fashion. So, if you often need to rely on ordered data, it’s beneficial to have supporting indexes. However, there are cases when SQL Server doesn’t normally realize it can rely on index order, but you can make the platform realize it with some extra manipulation and creativity. This article is the first in a two-part series in which I describe such tasks and solutions. This month I’ll talk about avoiding a sort with the Merge Join (Concatenation) operator. Next month I’ll describe avoiding a sort when needing the data in descending order. There is an index called idx_nc_shippeddate defined on shippeddate and orderid (implied due to the presence of a clustered index on orderid). The problem is that since the first ordering expression manipulates columns, similar to breaking sargability of filters, it prevents SQL Server from being able to rely on index order in this example. This results in explicit sorting in the plan for this query as shown Figure 1, and therefore n log n scaling. The plan for this query is shown in Figure 2. Notice in the plan that there are two index seeks used to obtain the data—one for the rows where shippeddate is not NULL (emitted ordered by shippeddate and orderid) and another where shippeddate is NULL (also emitted ordered by shippeddate and orderid). The two Compute Scalar operators produce the flag based on the constant—0 for rows where shippeddate is not NULL and 1 for rows where shippeddate is NULL. The Merge Join (Concatenation) operator than merges the two ordered inputs based on the order of: flag column, shippeddate and orderid. This operator is similar to the Merge Join operator, only instead of joining, it unifies two sorted inputs. Figure 3 illustrates how this operator works with a simplified example of two sorted integer inputs. · Fetch the first row in each of the sorted inputs. o If the left sort key is less than or equal to the right sort key, emit the left row and read the next row from the left input. Otherwise, emit the right row and read the next row from the right input. · If any rows are left in any of the inputs, emit those. The beauty of this algorithm is that it can be applied to preordered inputs based on index order scans (or seeks and range scans), like in the plan shown in Figure 2, meaning that in such a case the plan scales linearly. The plan for this query is shown in Figure 4. The plan for this query is shown in Figure 5. Observe the use of the Merge Join (Concatenation) applied to the two preordered inputs, emitting the unified rows sorted like the window function needs; hence, no explicit sorting is used. In other articles I cover solutions to tasks involving intervals where I rely on this trick to avoid explicit sorting. You can find examples in a series I wrote about Calculating Concurrent Sessions (Part 1, Part 2, Part 3), and in an article on Packing Intervals. In those solutions I unify interval start times with interval end times to one chronologically ordered sequence of events, and, using the Merge Join (Concatenation) operator, avoid the need for explicit sorting. The CustSales table has a row per customer (custid) and a column per order year (valyyyy), with the total order values for the current customer and year. Observe the code creates an index on (valyyyy, custid) for each of the three order years. The task is to unpivot the data so that you get a row per customer and year, with one result column holding the year (call it orderyear) and another holding the value (call it val). In addition, you want the result to be sorted by the val column, ascending. The plan for this query is shown in Figure 6. Observe the explicit Sort operator in the plan. With 1,000,000 rows in the source table, it took this query 4 seconds to complete on my machine (with results discarded to focus on processing time). Due to the need for explicit sorting, this plan scales in an n log n fashion. The plan for this query is shown in Figure 7. 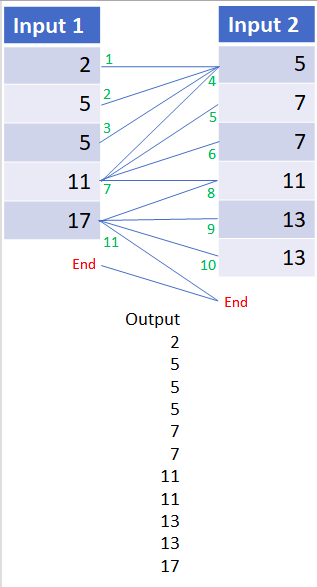 As you can see, the plan is very similar to the one used for the solution with the UNPIVOT operator, and also here the plan applies explicit sorting. This query too took 4 seconds to complete on my machine, and has n log n scaling. Figure 8 shows the execution plan for this solution. This technique leverages the order-preserving Merge Join (Concatenation operator), which relies on index order, twice—once between the queries that handle the years 2016 and 2017, and another time between the result and the query that handles the year 2018. This query completed in 1 second on my machine and has linear scaling. The plan for this solution (using SentryOne’s Plan Explorer) is shown in Figure 9. Amazingly, five Merge Join (Concatenation) operators are used in this plan, without the need for explicit sorting, hence this plan scales linearly. This article demonstrates the use of query rewrites to enable the use of optimal optimization capabilities. The focus of this article was avoiding explicit sorting by using techniques that can leverage the Merge Join (Concatenation) order-reliant and order-preserving operator. Next month I’ll continue the coverage of explicit-sort avoidance by discussing queries that need to handle data in descending order.